In a story that looks like it could have come from The Maury Povich Show, a conflict appears to be brewing between the Brea Police Department and the Orange County Sheriffs Department. 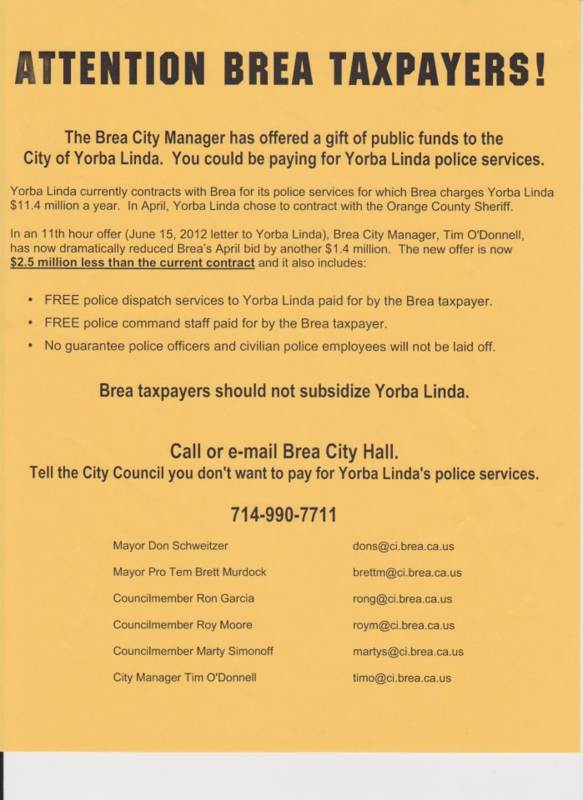 Clearly the Orange County Sheriffs Department already has the upper hand with the decision being made by the Yorba Linda City Council to give them the contract. This is actually a wise tactical move to ensure that enough pressure is applied in Brea to stamp out any threat to the contract. Brea Councilmembers are obviously going to be worried about their own city in an election year and will unlikely push the issue further for fear of losing votes in November. The political season is upon us and decisions are often weighed carefully by consultants on what impact it will have on voters. With the Brea PD going up against the OCSD though it should make for an interesting November election both on Yorba Linda and Brea. This entry was posted on June 25, 2012 at 9:57 AM	and is filed under Brea, Yorba Linda. You can follow any responses to this entry through the RSS 2.0 feed. You can leave a response, or trackback from your own site.